Do you essentially identify with three or more of the following five character traits? Intellectually able, has a low tolerance for stupidity. Incurably inquisitive, always curious about what lies beyond the horizon. Needs autonomy, will utilize fight or flight when autonomy is threatened. Excessive zeal in pursuit of interests, does not like others to perform according to low standards. Unbalance between emotional and intellectual self-confidence, one is quite stronger than the other, of vice versa. Xi for short, for eXtra intelligent and eXtra intense. We call the owner of Xi an extra intelligent person, or XIP. In the plural: extra intelligent people, or XIPs. In the same way one could recognize that other people (adults or children) are XIPs, even if they are not interested in, or even averse to the subject themselves. The issue is not about labeling or not labeling someone an XIP. It is about whether the hypothesis of someone being an XIP offers a better explanation for various behavioural patterns, for characteristics of interaction, for choices about life and work, than maintaining the assumption of being just normally intelligent or intense. The hypothesis can be explored, validated and put to use as deemed appropriate to increase personal effectiveness and well-being, and to stimulate personal growth. XIPs are a colourful lot: They can be brilliant, exasperating, full of ideas, dramatic, galvanizing or depressing, hilarious, persistently destructive, aloof or overwhelmingly helpful, and show many of these aspects even simultaneously. 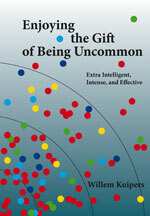 As far as it goes, usually three keywords apply: intense, uncommon and diverse. That implies that you should always rely on your personal observations to ask yourself: Is this information relevant and helpful in my situation? Just because of the enormous diversity among XIPs, one characteristic may be very pronounced in a specific XIP, while another is absent and so on. I just intend to offer leads regarding the interesting question: “What is it like to be you?” The answers to these question lead often to increased personal effectiveness, due to a clearer awareness of one’s identity.